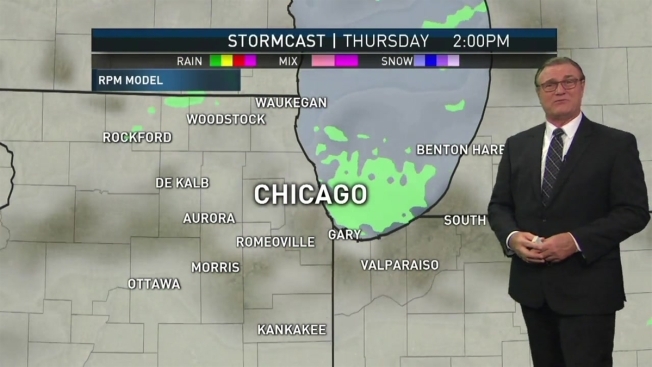 Stormy weather is in the forecast over the next 24 to 36 hours, and NBC 5's Brant Miller has all the latest details. Nearly all of the Chicago area was under a Severe Thunderstorm Watch and some counties were under a warning Wednesday afternoon as storms began moving their way into the area. A Severe Thunderstorm Warning has been issued for five northern Illinois counties until 7:45 p.m. Lake, Kane, McHenry, DuPage, and Cook counties are all impacted by the warning, which could see half-dollar size hail and 60 MPH wind gusts hitting the area. More severe weather is expected in the evening and overnight hours. As the atmosphere continues to grow unstable, showers and thunderstorms were expected, some of which threatened to become strong to severe, bringing the potential for torrential rains, large hail, high winds and the chance for a tornado. A watch was issued just after 4 p.m. for 18 counties in Illinois, including DeKalb, LaSalle, Cook, DuPage, Kane, Kankakee, Kendall, Lake, McHenry and Will counties in Illinois. It remains in effect until 11 p.m., according to the National Weather Service. The watch was later extended to included Benton, Newton, Jasper, Porter and Lake Counties in Indiana. Heading into the evening, showers and storms were expected to grow more numerous. Nearly all of the Chicago area remained under a slight risk for severe weather Wednesday. Any overnight storms are expected to fade by dawn Thursday, paving the way for another day of mostly cloudy skies, humid weather and the chance for an occasional passing shower or storm. By the late afternoon and evening Thursday, however, more storms are possible, once again bringing the threat for severe conditions. Friday looks to be mostly cloudy with few morning showers likely. Highs will stay in the low- to mid-70s.